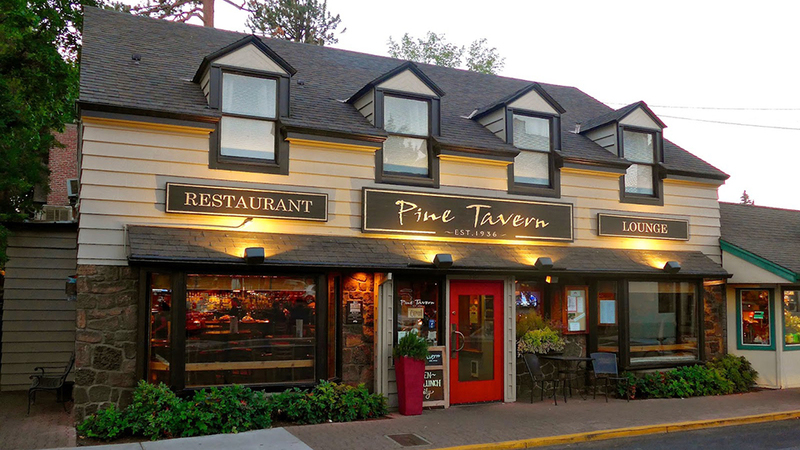 The Pine Tavern is not only one of Bend Oregon’s best restaurants, but it’s a tradition for locals and tourists alike. The Pine Tavern was founded in 1936 by two enterprising women named Maren Gribskov and Eleanor Bechen. At a time when the country was just barely pulling itself out of the Great Depression, these women built a thriving business serving a growing population of timber industry workers and their families. During World War II, Pine Tavern guests included soldiers stationed at Camp Abbot (now Sunriver) and the occasional tourist or skier who stumbled upon Bend. As Bend grew and things changed, so did the Pine Tavern. Some years, the restaurant favored casual family dining. In other years, meals were served on white linen tablecloths and fine china. A major renovation in the 50’s enclosed two gigantic Ponderosa Pines in the Garden Room, whose trunks are still visible today. The Pine Tavern now features one of the loveliest lunch spots in Bend on their garden patio sitting above Mirror Pond. Besides its long history and tree trunks, the Pine Tavern is known for its “scones” and honey butter. Not resembling traditional scones at all (they’re deep fried and sourdough based), they are a Bend tradition. In 2014, the restaurant joined the collection of iconic restaurateur, Bill McCormick.